The three aforementioned sayings are each different – each their own. Yet, the individualities of these phrases are melded together under an expanded thread of connected sentimentality when placed together. The separate implications remain but, once within a shared space of thought, the three ideas support one another in ways that are not identically experienced when alone – and not even just in a, ‘whole is better than the sum of its parts,’ kind of way. Such can be said for the chemistry and musical permutations brought about by Sarah Jarosz (Banjo, Guitar, Mandolin, Vocals), Sara Watkins (Ukulele, Guitar, Fiddle, Vocals), and Aoife O’Donovan (Guitar, Synth, Vocals) as their new band endeavor, I’m With Her. Despite running with the idea of nurturing this new band together since 2015, Watkins, Jarosz, and O’Donovan are only just now getting to see a concentrated release of their combined artistic labors with today’s arrival of full length debut, See You Around (Rounder Records, 2018). That isn’t to say these three musicians have been stalling for time or short on ideas after an initial spark. No, I’m With Her has been actively working and playing plenty, creating build up and anticipation that feels akin to an uncommon convergence like a blue super moon or Ash Wednesday being on Valentine’s day (Though perhaps the realness of both those events actually occurring recently is all the more indication this is exactly the year a group like I’m With Her should come along and have its break out.) In the time between a first serendipitous serenade at the 2014 Telluride Festival and the creatively dense retreats the trio took in L.A., Vermont, and Bath, England, for writing and recording respectively, these folk veterans drizzled singles of covers, an EP with a first original single, and what felt like a cavalcade of live appearances, worldwide. What has come about from all this waiting and the careful gelling of three deeply established voices in the roots music community is a record that feels simultaneously collaborative in the merging of musical footprints and consciously solitary in its finished expression. What See You Around isn’t, is a simple piling on of Watkins’s, O’Donovan’s, and Jarosz’s talent in a recording booth, even though the women having mutually seasoned experiences in the studio might make this project seem otherwise. (This ironically on top of the fact that mixer/producer Ethan Johns (Ryan Adams, Laura Marling, Paul McCartney) embraced the idea of the women indeed recording all together and live, with nary a separating foam insulator between them.) Certainly there are marks of familiarity from each artist in the 11 original tracks and one Gillian Welch closing cover (“Hundred Miles”) that comprise the album. Somberly brooding “Pangaea” opens with Jarosz and O’Donovan describing a harrowing scenario (What’s left / When the ground cracks / And the sky is black) in the form of long held notes that have the pair harmonizing in droning fifth and fourth intervals. This gives the song a delicately celtic, folk tune, quality – a style often appreciated by O’Donovan in her solo work. Meanwhile midway track, “Wild One,” contrasts with its own title and encourages deeper listener investigation, as Watkins leads the narrative on a melodically soothing track that sounds very much akin to the demeanor heard on the title track of her own latest solo release, Young in All The Wrong Ways (New West Records, 2016). Not to mention, the idiosyncrasies worth appreciating in things like Jarosz’s specific touch with the mandolin during “Wild One’s” bridge or, the cheerful and straightforward way she sings short stories like the album’s opening title track. Jarosz’s approach allows one’s ear to focus on her delivery of musical tone over secondary vocal twists. In either case listeners arrive knowing, or will come to know, instantly, when the effervescent banjoist is at the mic for her voice or her strums. It isn’t all just a recollection of the women’s cumulative styles of course. The complete newness of I’m With Her’s own musical coloring comes out nicely in some shining moments of unexpected musicality and sonic shaping. Johns contributes some interesting instrumentation to the trio’s multifaceted playing with the help of a slide guitar (“Ain’t That Fine”) and a harmonium (“Hundred Miles”). Watkins’ fiddle echoing with a smooth, almost spooky, distortion and lengthy tone delay at the end of “Pangaea” is a small but striking instrumental garnish. Immediately thereafter, “I-89” inspires a few pleasant head turning surprises of its own, when a mildly fuzz toned and jaggedly distorted lead guitar ushers in a hook that doubles up with O’Donovan, who leads with her own slurry yet flittering vocals that detail the move for an escape that’s both literal and emotional (Take a minute to remember baby / Think of my hand pressing on your back / When you said you hoped no one will ever love me / I’ll never forgive you…If there was another way out I’d take it / If there was another way down I’d go / If there was another way other than the highway / Show me on a map, point out the road). All of the story is then given room to breathe; with the song’s dynamic levels ebbing and flowing notably enough to boast pre-1996 appreciation for sonic peaks and valleys (a production choice that seems momentarily audible before the bridge on penultimate track, “Close It Down,” as well.) All the same to the multi-layered uniqueness I’m With Her presents, it would be a disservice to the band’s sheer combined musical skill not to note that instrumental track, “Waitsfield,” is a standout treasure for that reason alone. The fact that its melodically whimsical hook falls into an eventually galloping tempo and practically shouts for a fun folk jam session aside, the abrupt full-stop and the tonally unresolved ending being followed by the surprise retention of candid laughter and speech at the very end only further instills the takeaways of spontaneity, serendipity, and live performance – all the very things that brought I’m With Her into being from the start. Conceptually, See You Around swivels effortlessly past gender expectations of narratives sometimes befalling the folk genre – leading it to even occasionally sound deliberately progressive and cross-generational (Oh I want to climb the hillside / But I hear the women wail / Of a cautionary tale / It starts with just a whisper / Calling me to stay / Why would you wanna leave us / Everything we gave And everything we made). The lyrical bouquet assembled on See You Around covers a range of emotional stances for the women of I’m With Her and injects fresh takes on lesser appreciated topics like: coming of age realizations (“Ain’t That Fine”), rejected seduction (“Close It Down”), and female led infatuation (“Ryand (Under the Apple Tree)”). Ultimately however, the trio’s aforementioned approaches to orchestration and Ethan Johns’s production stand out here; setting the stage for outlining what O’Donovan, Watkins, and Jarosz are and will be capable of doing, for many albums to come, even as the individual stories that fill future liner notes change over time. 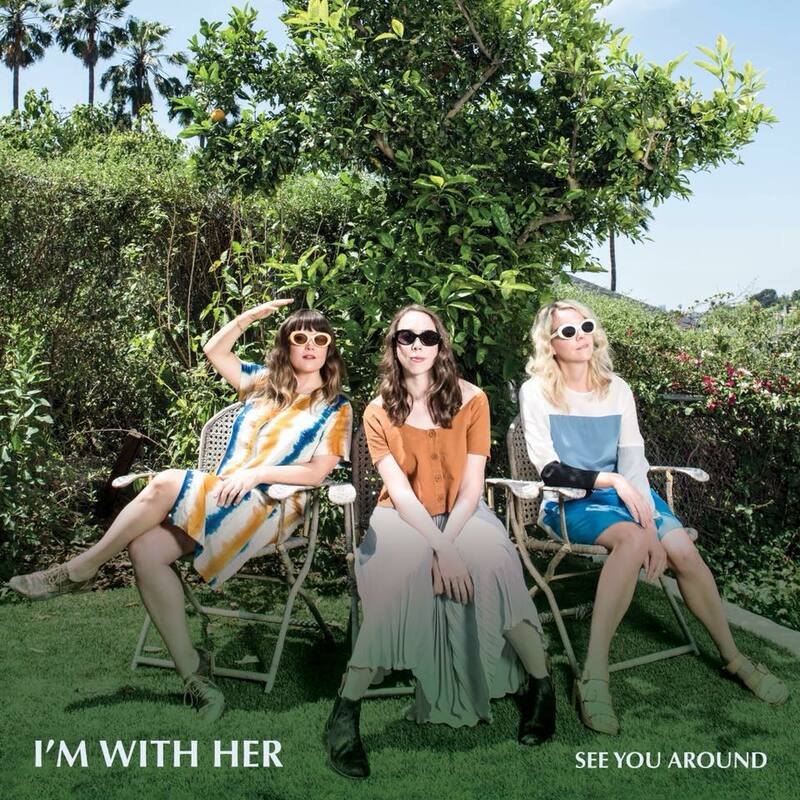 I’m With Her will be touring throughout the U.K. And U.S., in celebration of See You Around, starting on 28 February. They stop in New York for shows at Rough Trade NYC on 20 February, and then again on 15 March at Town Hall. Tickets for all shows and information on the rest of the tour is available HERE. See You Around is available now via Rounder Records, through the band’s online store, Amazon, and iTunes.